The blood is pumping, heat is building and the legs are pounding – could be a typical night clubbing in Aruba but it is, in fact, the island's latest sporting attraction. Aug. 17, 2017 - PRLog -- This all-action Dutch Caribbean destination has added mountain biking to its growing list of sports facilities to appeal to those for whom sun, sea and sand are not quite enough holiday activity. For those addicted to the sport or for newcomers anxious to try it, Aruba has designated two mountain biking trails in the north of the island and, with bike hire readily available, it's easy to saddle up. 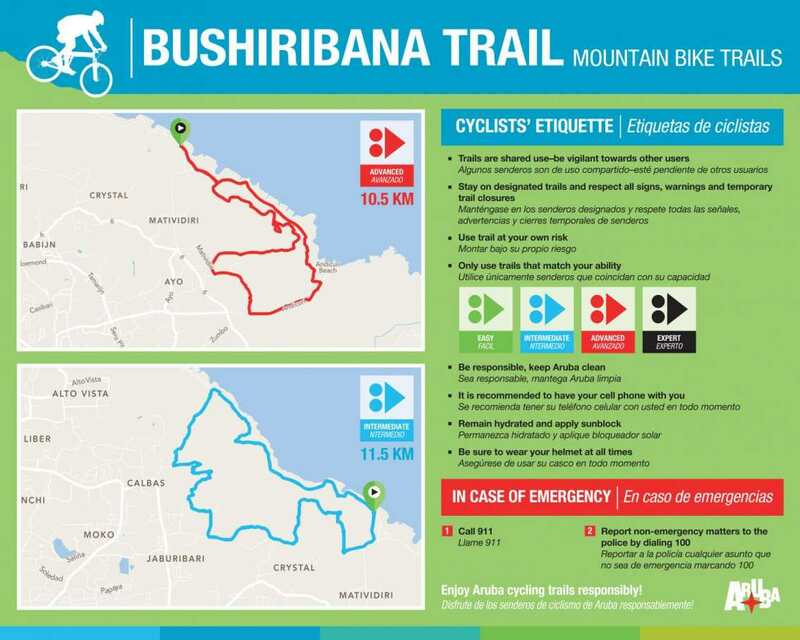 Two different biking trails have been designed, with a different level of difficulty for each. The 11.5 km (7.2 miles) Alto Vista route is an intermediate level trail, while the Bushibari has an intermediate and an advanced level trail. The advanced is 10.5km (6.5 miles), while the easier alternative is 11.5 km (7.2 miles). Both offer great views of the Aruba scenery and the Aruba Tourism Authority has produced trail guides with descriptions, photographs and maps to help plan one's adventure. And, using sat nav technology, bikers can track their time, route, distance and calories burned. Aruba has a great pedigree for sporting action for visitors, hosting international competitions for such sports as windsurfing, beach tennis, triathlon, marathon and half marathon. All manner of watersports are catered for around the island and major hotels boast state of art fitness facilities and classes for such activities as yoga. Hiking trails take in the island's desert-like Arikok National Park, as do some of the horse-riding routes. Designated jogging tracks abound, the island has an 18-hole and a nine-hole golf course and tennis is also popular.